Spray a glass baking dish with Olive Oil Cooking Spray. Place the Potatoes in the dish skin-down. Then a layer of Baby Carrots, then Gardein, and then last layer should be Onion Slices. Then spray with more Olive Oil Cooking Spray. Bake uncovered for 30 minutes, or until the Onions and Gardein are brown. When you remove dish from the oven, separate the Gardein and Onions into a bowl and the Potatoes and Carrots into a Dutch oven. Mix the remaining ingredients into the Dutch oven. Keep the Gardein and Onions separate for now. Be sure and stir it a few times to make sure the Herbs are mixed in. Put your Dutch oven with the lid on back into the oven and let simmer for another 30 minutes. Check on it and stir during that time once. Remove from heat and taste. This is when you can check to see if your vegetables are tender, and add more Braggs for salt or pepper if it's too bland. I add a few dashes of Black Pepper and put my Dutch oven back in for another 10 minutes because my Potatoes weren't right yet. Then, mix in Onions and let simmer on your stove top for 10 minutes on a medium heat. This pot should make around 5-6 bowls of Stew. Separate your Gardein into how many servings you think you will want/have. I based mine our soup bowl size. To serve, put one serving of Gardein into your soup bowl and then with a ladle fill the bowl with Stew over the Gardein. This will reheat your Gardein and keep it from getting mushy in the broth. When you go to out away your leftover Stew, store the Gardein separately. Don't forget to enter our Shannons @ The Movies Contest! 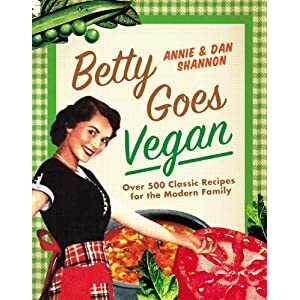 I mean, can you think of a easier way to win a Meet The Shannons Apron and a bunch of Vegan Goodies? I can't. Is there a good way to make this if I don't have a Dutch Oven? Crockpot, maybe? I think a crock pot or in a large soup pot in the stove would work - I wouldn't change the first step with the Gardein and Onions though. That really worked out pretty good and is one of my favorite flavor in the recipes. I think so. Most Meat Eaters I know who have tried Gardein like it and the broth is pretty flavorful so it doesn't seem like anything is "missing". Hey if you can't Larp on Halloween - When can you Larp? Ooh this sounds good, and definitely like something I'd make for omni guests. Thank you! This stew absolutely rocks, I just want to sit down with the whole pot and eat until it's gone. I don't have a dutch oven either so I did it on the stove top in my stock pot. Yum! Gonna try this with some Ray's Wheat meat. Yes, WOW is all I can say. Made this for a friend who is not well. I was looking for something with consistency, tastes geat and I am sure she is going to love this! I actually left out the gardien beef but added corn, green beans, great northern beans and used russet potatoes instead. 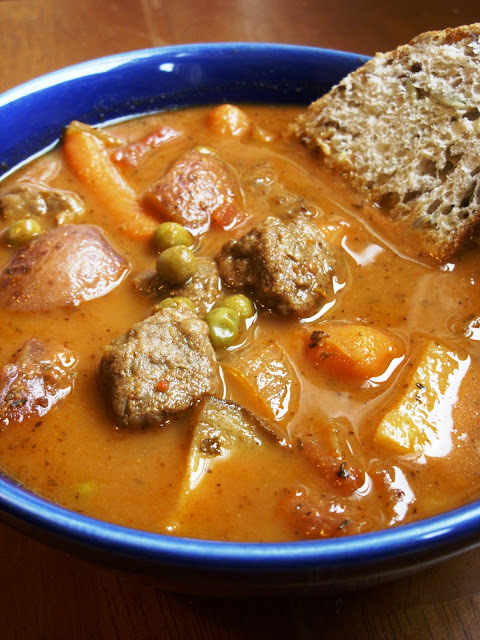 This is hearty, thick and an awesome vegetable stew! This stew was delicious! Thanks very much for your work converting these recipes! Going to try your version of Tuna Casserole next.